Some of the biggest and best baseball teams in the world, the 30 teams that make up Major League Baseball, began their 162-game seasons this week. Six teams took part in Opening Day on Sunday, April 3rd, and the rest of the league played their respective first games the day after. This MLB season will be the 113th season in the organization’s history, ever since the American League and National League combined in 1903. Spring training for the season, which is effectively a pre-season for teams to prepare for the regular season ahead, has led into the regular season that commenced in Opening Day. The first matchup took place early in the afternoon on the 3rd, according to MLB.com. The St. Louis Cardinals took on their National League Central Division rivals, the Pittsburgh Pirates, at PNC park. The approximate 1:05 PM Eastern Time first pitch was the first of the league’s whopping 2430 total games that will be played by the time October postseason baseball rolls around. The Bucs beat the Cards by a score of 4 runs to 1. The American League favorites, the Toronto Blue Jays, played the Tampa Bay Rays later on in the day, beating them 5 to 3. But the biggest game of the night was always certainly going to be the rematch of last season’s World Series matchup as the New York Mets played the reigning champions, the Kansas City Royals. The contest between two of Major League Baseball’s most skilled teams rounded out the first day of the 2016 season, ending with the Royals topping the Mets 3-2. 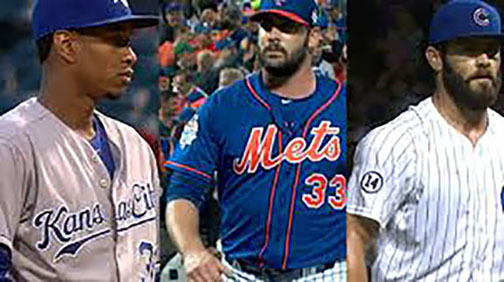 Both the Mets and Royals are expected to contend once again this year, with the Royals’ stellar lineup hoping to repeat as champions. World Series favorites for 2016, the Chicago Cubs, continued the festivities on the Monday after Opening Day when they travelled to Anaheim to play the Los Angeles Angels. This interleague game (the Angels are in the American League while the Cubs play in the National League) debuted many of the Cubs’ newest team members, as the team had an eventful offseason that included the purchases of many star players. New additions such as Jason Heyward, Ben Zobrist, and John Lackey are expected to add more firepower to a team that finished as runners-up in the National League last year. The Cubs showed off their potential by crushing the Angels 9-0. Monday, April 4th will end with every MLB team having begun their seasons. Notable headlines from the follow-up to Opening Day included Zach Greinke getting his first start for his new team, the Arizona Diamondbacks. The biggest blowout of the day was the L.A. Dodgers’ 15-0 annihilation of the San Diego Padres. The intriguing slate of games will certainly be leaving fans eager for more of America’s pastime in the upcoming summer months.